Although a beautiful shiny silvery element and has many applications, and is recognized as a deadly pollutant. Air borne mercury is deposited in rivers and the ocean causing a chain reaction of fish poisoning and if this consumed poisoning in human populations and animals. 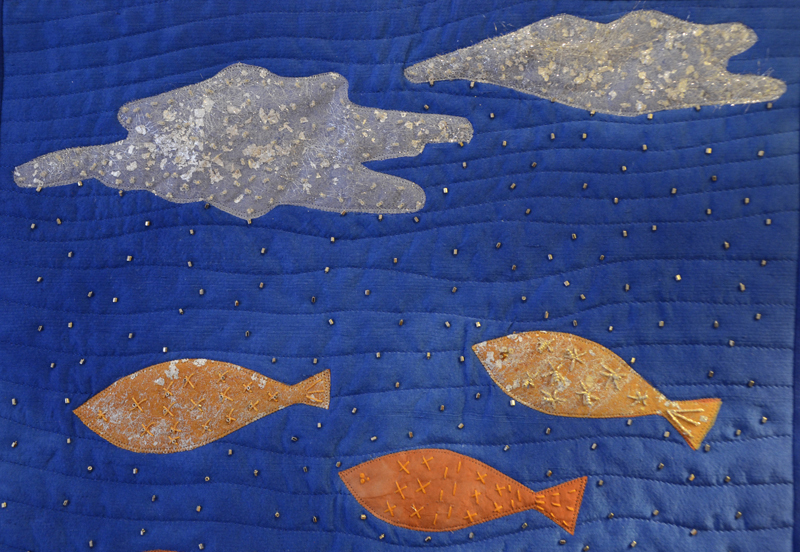 My quilt depicts mercury clouds depositing mercury particles in the ocean and poisoning fish. The mercury clouds are silk organza fused with Angelina fibres and silver flakes. Small silver beads depict the mercury particles falling into the ocean. 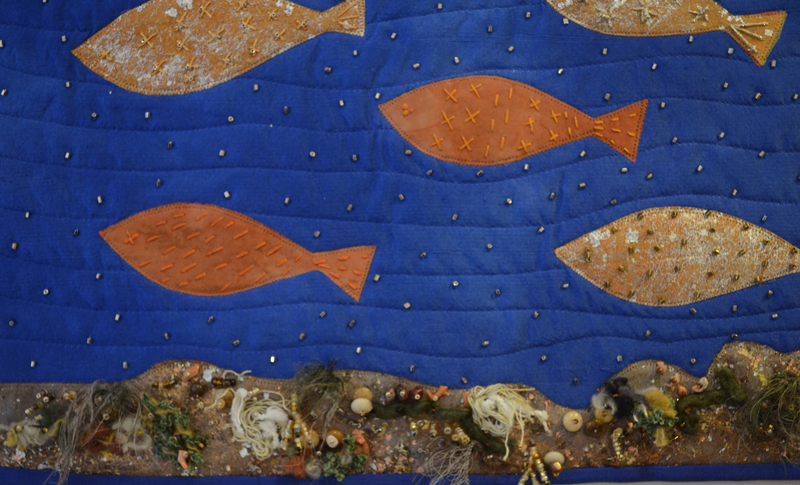 Not all fish are affected, so I have fish fused with silver flakes and embellished with thread and beads (contaminated fish) and plain uncontaminated fish. 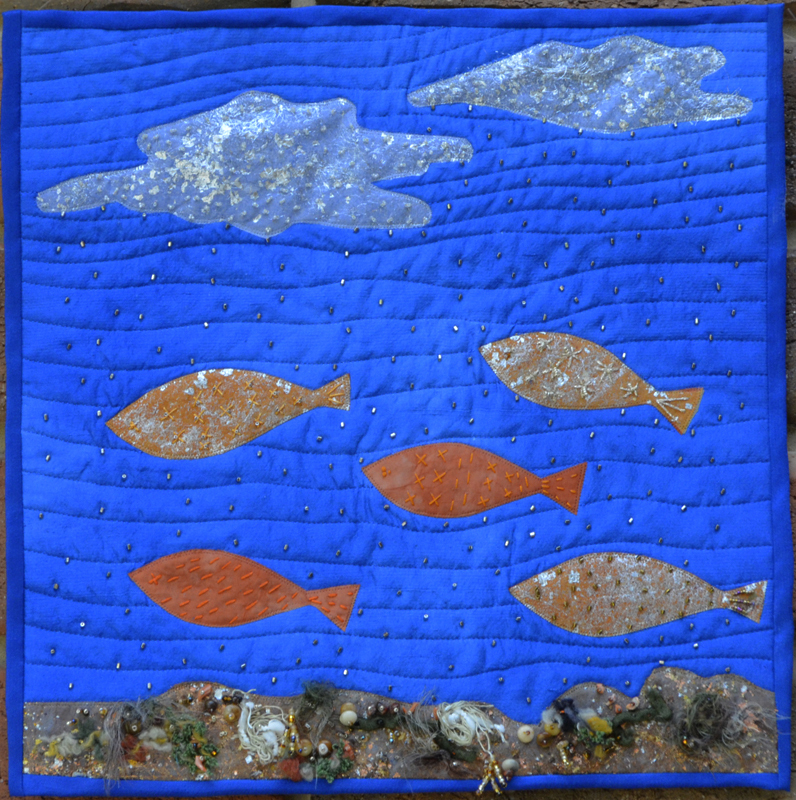 Mercury also settles on the ocean floor – here I have used Brown silk fused with Copper and Silver flakes and embellished with beads and thread. Materials are hand dyed silk, silk organza, beads thread, Angelina Fibres, Silver and Copper flakes. I apologise for the photography, the blue is near to true in the bottom photographs. What a powerful message, love the healthy and unhealthy fish! Indeed a powerful message. Very nice interpretation. Nice work. I love the embrodery stitches on the fish. Good use of the different materials. I really like your ocean floor with the beads and threads.